Mirima National Park also commonly known as Hidden Valley National Park is a National Park in far northern Western Australia located at the eastern side of the Kimberley region. It is located approximately 2,220 kilometres (1,379 mi) from Perth just outside the township of Kununurra. The park covers a total area of 2,068 hectares (5,110 acres) and was declared a national park in 1982. Unusual sandstone formations dominate the park and are often compared to the Bungle Bungles. The area is of great significance to the local indigenous peoples, the Miriuwung, and several examples of rock art can be found within the park. 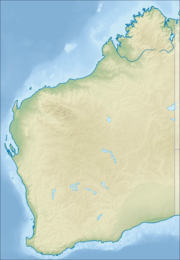 "Mirima" is the name given by the Miriwoong people to the area extending some 150 kilometres to the north and south, and 170 kilometres to the east and west from Kununurra. Access to the park is via a sealed bitumen road and an entry fee to the park applies. Camping and fires within the park are not permitted. Facilities include toilets, tables, information shelters and three walk trails around the park. ^ a b "Department of Environment and Conservation 2009–2010 Annual Report". Department of Environment and Conservation. 2010: 48. ISSN 1835-114X. Archived from the original on 11 January 2011. ^ "Kununurra Tourism National Park Guide" (PDF). 2008. Archived from the original (PDF) on 28 November 2009. Retrieved 7 March 2010. ^ "Far North National Parks of WA". 2006. Retrieved 7 March 2010. This page was last edited on 11 June 2017, at 02:07 (UTC).